SADUS ATTACK!! 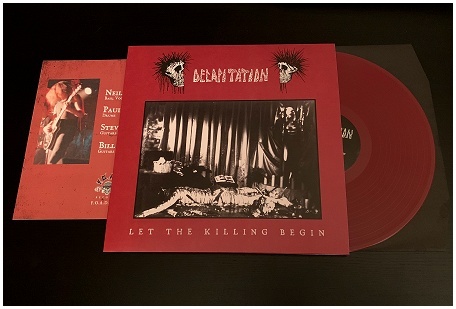 Possibly two of the best deadly Thrash demos of the 80s finally available on vinyl in a great sounding quality version. This collection includes "D.T.P." (Death To Posers, 1986) and "Certain Death" (1987). Blazing fast infernal Thrash from this long running Californian horde formed in 1984. They sounded like Slayer at 45rpm with a drumming work often running at blasting speeds, crazy riffing and vitriolic screaming vocals.. together with Wehrmacht and few more this was the fastest Thrash around at those times. This is the best chance to get their two rare demos in a really great sounding version. 8 tracks that will leave your face twisted! HALLOWS EVE "The neverending sleep"
DIABOLICAL MESSIAH "Compilation of ancient campaigns of death"